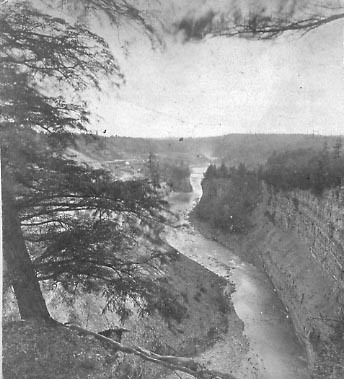 "1536- View from high bank below Middle Falls"
"Portage Falls and Vicinity, Genesee River, Livingston Co., N.Y."
Although this stereo image taken from Inspiration Point does not have the sharpness of some other views, it provides a glimpse of the mind of the photographer. If you compare with Image 24, it appears that Sutton is attempting to provide the viewer with a rustic view of the Portage gorge free of two major works of "progress", the Portage Bridge and the Genesee Valley Canal. The well place pine tree to the left does more than partially frame the gorge and provide a great stereo effect - it also hides most of the scars of the Canal some prominent in other views. In the distance the Portage bridge is all but invisible in the mists of the Upper Falls. Although Sutton views are few in number, most provide interesting variations of the regular "tourist views".